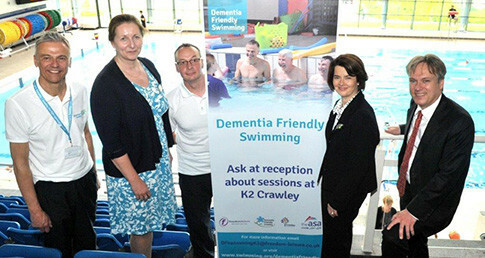 Jane Ellison MP visited K2 Leisure Centre in Crawley yesterday (19 May) to mark the launch of the Crawley Dementia Friendly Swimming Project. The project was launched at the Living Well Day, which was a partnership event. It was run with support from Freedom Leisure, the ASA, the Alzheimer’s Society, Age UK, Crawley Dementia Alliance and Crawley Wellbeing. The Dementia Friendly Swimming project is a collaborative venture which was developed with the ASA and the Department of Health Innovation, Excellence and Strategic Development Fund. The success of the project is down to the involvement of local and national partners, including councils and charities. Find out more about the Dementia Friendly Swimming Project. K2 Crawley has recently signed up to be part of the Dementia Friendly Swimming Project. The facility is working to proactively train staff and consult with visitors to create the right setting. This will make the swimming experience better for people with dementia and their carers by improving facilities and taking away barriers. Jane Ellison MP commented, “We want England to be the best place in the world to live with dementia, in communities that are more dementia friendly. Local initiatives like Crawley’s will help us achieve that. Freedom Leisure Area Manager, Nyssa Jackson, said, “It is a great privilege to be invited to offer Dementia Friendly Swimming to the Crawley community. Our annual Living Well Day is the perfect opportunity to launch our programme. “This week is Dementia Awareness Week and K2 Crawley is, for the fourth year running, offering a selection of dementia-friendly and free taster activities for people aged 50+. Clearer mind, greater positivity and a stronger sense of self-worth. Giving people a sense of place. To find out more about the K2 Crawley Dementia Friendly Swimming programme contact dfswimmingK2@freedom-leisure.co.uk or call 01293 585300.